The lifetime of the Plate Heat Exchanger can be extended with regular observations and inspections, especially on the parts and components. Below are some of the frequently observed faults and problems that can potentially hinder the overall performance of the Plate Heat Exchanger. If fault(s) is detected, please contact us (hyperlink to contact us page) and inform us on the unit manufacturing number to schedule a servicing appointment with our technical staff. -	A reduced in hear transfer performance is an indication to the user to clean the plates. Plates cleaning are necessary in order to remove scales deposited on the plates over time due to supposing scaling on the heat transfer surface. Consequently, the overall heat transfer performance will be reduced once scaling occurs on the heat transfer surface. -	A reduced in flow performance is an indication of clogged port holes inlet and/or scaled plates. 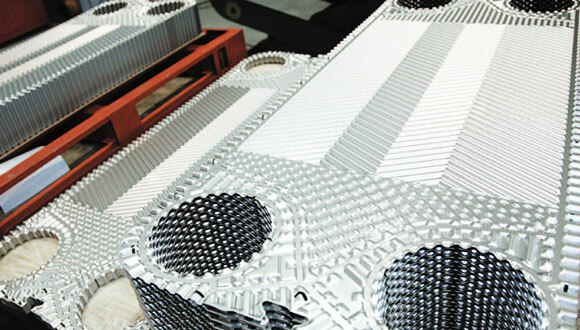 Therefore, regular inspections are necessary to restore the overall performance of the Plate Heat Exchanger with thorough cleaning and maintenance. -	It is possible that corrosion or damage to the intermediate plate will cause the counter-current flowing mediums to be intermixed. Hence, regular inspections are needed to prevent this phenomenon by replacing the damaged plates. Aforementioned are possible reasons that may cause fluid leakage from the plate pack. Therefore, regular servicing and maintenance are important to ensure that the overall performances of the Plate Heat Exchanger are not compromised. If leakage is found from the S – frame due to aforementioned possible causes, then, it is necessary to replace the damaged part in order to restore the performance of the Plate Heat Exchanger. 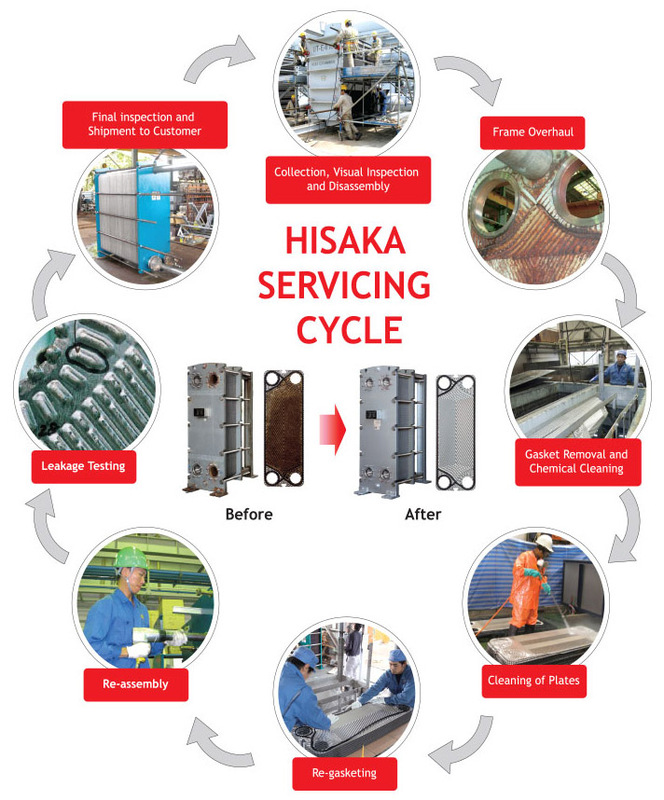 At HISAKA, we sincerely cater our servicing packages in order to meet the highest possible customer’s satisfactions from all customers, be it locally or internationally. Dismantling the tightening bolts from the PHE √ √ √ √ Before CIP initiation, all inlet & outlet nozzle connections must be disconnected.